Vaughan Williams's violent and pessimistic 6th Symphony is in stark contrast to his preceding Fifth Symphony. Haitink, continuing his impressive RVW symphonies cycle, gives a truly impressive reading in superb sound. His opening Allegro has swagger and bravado aplenty and the glorious big tune, great nobility. The Moderato builds wonderfully up to a shattering climax while the scherzo sounds really demonic and the Epilogue is chill and mysterious enough. Haitink closely approaches Andrew Davis' blistering reading, with the BBC SO, on Teldec. 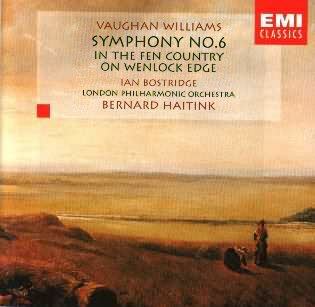 But this is now the recording of the orchestral version of On Wenlock Edge, Vaughan Williams's wonderful settings of A.E. Housman's memorable verses. Never have RVW's bells rung so evocatively over Bredon Hill depicting summer warmth and love and life, and winter chill with the cold hand of death. The gales shriek realistically around "On Wenlock Edge" as Ian Bostridge trenchantly compares the ancient Roman's troubles with his own. "From far, from eve and morning" glows,and the ghostly exchange between the dead and living is full of character and conviction in "Is my team ploughing" - Is my friend hearty? - Yes, lad, I lie easy, I lie as lads would choose; I cheer a dead man's sweetheart, Never ask me whose. Haitink gives us an affectionate and very evocative reading of Vaughan Williams's tone poem, In The Fen Country (1904 rev. 1905 and 1907). The work is a musical depiction of the skies and flat landscape around Cambridge and in Lincolnshire.